The case is unusual simply because I am unusual, the charts are my own, and I thought the title might lure more people to read beyond the headline. This personal SPDX was done many weeks ago. I also did transits to my horoscope to go with the SPDX Mandala. I think the pair offer some worthwhile information. From which even a novice can learn. The SPDX was done in September, several weeks after the event which prompted my doing it. I don’t quite know why it took me so long to do one, but the situation lasted for several weeks before and after the charts were drawn. I ask you to take a look at the SPDX before I explain what comes forth from it. If you have any thoughts or impressions about the mandala and/or horoscope. please do pass them on with my thanks. That goes with another story about the book I am now writing called The Way of A Frugal Physician. I started it in the spring, took a “break” during the outdoor months, and am now back at it. The injury was a valuable learning experience which I will be writing about in the latter pages of the manuscript. • Energy - Broken Sword. Well, we will never know if the leg was broken. But, the picture is very suggestive. • Lesson - That whole side of the Mandala is kind of a Downer. (Not unusually so.) Bringing me down to earth - in a way. Which goes along with the new meditation I began in that time period. A Heart Centered one. See the Way center. • Feeling - Well, I sure felt like a Dinosaur in that time period. I had never drawn that particular card before. I also passed into “retirement” age at the time. The rest of the SPDX is fairly positive. On the whole, it points to and meshes with salient aspects of the horoscope transits. 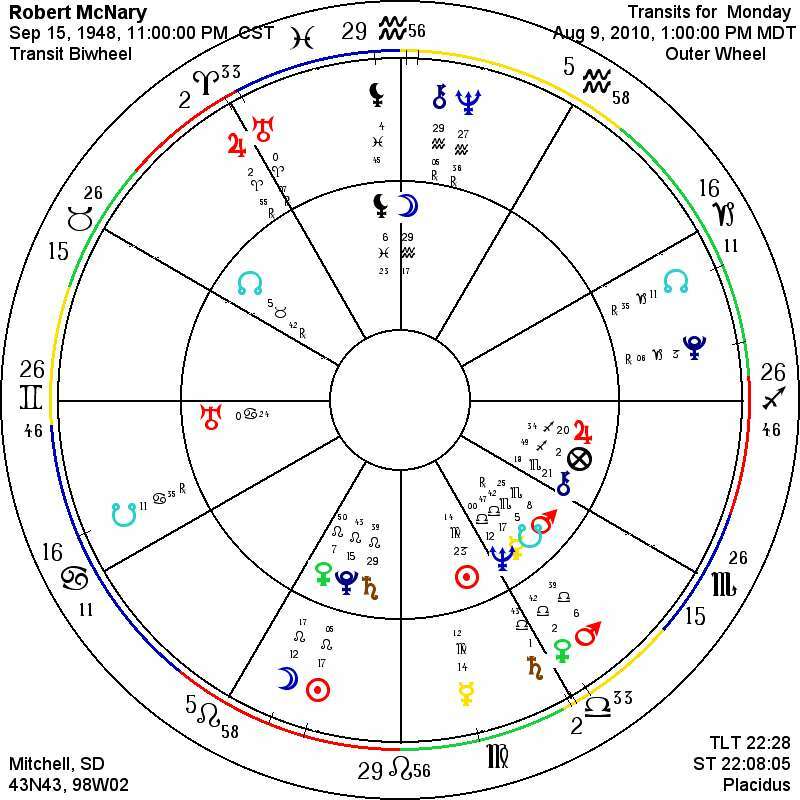 Horoscope Note (Posted below commentary): The inner section is my natal horoscope, the outer loop gives my transits for early in August when the accident occurred. • Mind - Man in the Moon. The Moon in my horoscope is at my Midheaven (very top of the chart) and was the astrologically the focal point of my injury. The Black Moons (10th house, both natal and transiting - look like a black moons on top of a crosses) were a little more than a degree apart. I find both Chiron and the Black Moon often involved in injury, mayhem and disaster. The Black Moon has Scorpionic, Plutonic and 8th house qualities - major change, transformation, touching the other side, etc. Somewhat witchy as well. • Persona - Witch on a Broom. This to me is Neptune - also connecting with the Moon - Witch and Moon often go together. The Witch’s Broom is also Neptune’s Sceptre. During this time period, I have been studying more and more deeply - or maybe in a more Neptunian way. Spiritualism, the inner life, meditation, raja yoga, etc. Neptune now passing my Midheaven is a once in a many lifetimes’ situation. As the circuit of Neptune to the Sun is 164 years. The likelihood of it passing over one of the four angles - Midheaven, Descendant, Nadir, Ascendant - with a luminary (Moon) conjunct in one lifetime is very small. The ankle injury was just a little bonus to go along with the other things happening with the transit. 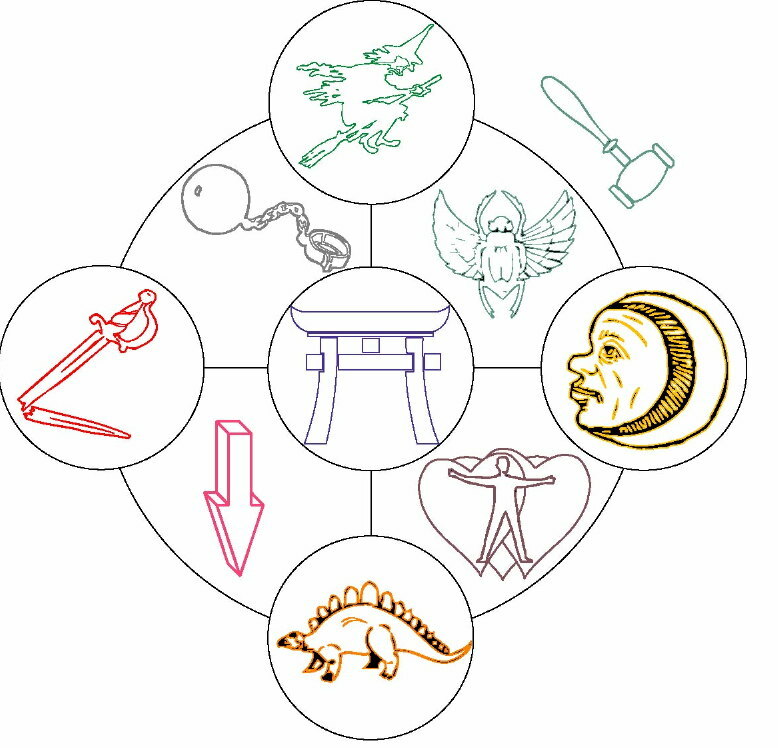 • Soul - Torii (Gate of Heaven) certainly fits with my recent studies and also with . . .
• Healing - Scarab. Ancient Egyptian symbol of rebirth. The ankle is about 98 percent now. No Xrays, no crutches - I did use a cane - thanks to my neighbor Donna, no pills, etc. Gavel seems to fit the two lawyers whose voluminous writings I have been reading recently. HS Olcott and William Judge. I suspect there is another layer of meaning to the Gavel, which I haven’t caught yet. This is just a once-over. I would be happy to consider your own reflections. Below horoscope find comments from readers. I gladly present comments on last week’s SPDX-Horoscope combination from three faithful readers of this newsletter. (Thanks to them for responding.) Their comments will be sandwiched around the essentials of my own commentary. If you want the whole of my comments, refer to last week’s eletter or click the link at the end of the page. Other Commentators (not common taters) are Peace Arnold (PA), Dyana Ray (DR), and Heather Rene Autrey (HRA). PA: I expect you've been feeling like you are getting old. However, longevity follows the stage of maturity, in the natural order of things. Western civilization scores low on this account.... However, the choice is yours and, from what I know of you, longevity is certainly an option for you. Look to your soul symbol for clues. HRA: Going within (Bottom half of circle/inner world) Again, Finding Freedom within. DR: Feeling – Toughing it out. Thick skinned? Blocked and/or blocking. Protecting. • Mind - Man in the Moon. DR: Mind – no ears – not listening? During this time period, I have been studying more and more deeply - or maybe in a more Neptunian way. Spiritualism, the inner life, meditation, raja yoga, etc. The ankle injury was just a little bonus to go along with the other things happening with the transit. DR: Healing – gavel/mallet, mold (?) – getting attention – careful not to squash the bug, the little guy! HRA: The Gavel to me represents Judgements from others or from self ~ (surrounding 8th H./Soul,Emotional realm)Transcending/Purging any Judgements that may still be, carried up until this time. Bringing new balance to physical/with spiritual self. Becoming current,up to date. PA: Well, Robert, the gavel to me brings to mind a decision made. Done, and now we move on. Focus your energy to your earth connection and healing the broken connection... perhaps, indicates a Rebirth right here on earth..to stay and continue with your current adventure..
DR: General Comments: Why asking for comments at this particular time? Lots of delays around this - what is reason for delays? What were you putting off? Something that maybe felt like that ball and chain? “Scope” – Did it have to do with writing? Can’t write when on a ladder. What were you thinking about when event happened? What was going on around you? Was there any anger? Interesting to note that I had emotions through this process almost from the beginning – a first. My buttons pushed somehow? Making it personal? OR is it intuitive thing? I debated about sending comments because of the emotional aspect, however, “TRUST” flashed, so they are now “out there”. Your readings – or mine? Or does this take ALL of us to a different level? As you grow, we grow and as we grow, you grow. Of course, it does. I’ve just not experienced anything in this way before. Dinosaur: Toughing it out - I suppose dinosaurs tough things out, I often do. I'm reminded of the time Old Bill Jones introduced me at a Museum meeting, speaker coming up to talk on Dinosaurs. Bill says, "Robert never met a Dinosaur he didn't like." Play with that one. Also, the suggestion about reviewing past especially in relation to scarab. I certainly have been doing more of that than maybe ever. Gavel: Since it is in healing, my general thought is that the symbols there are about completion in some manner. Gavel goes down and So Mote It Be. I don't know why the scarab is under it. Thanks again for the comments. If any reader would like go this process in the future, s/he can be accommodated.